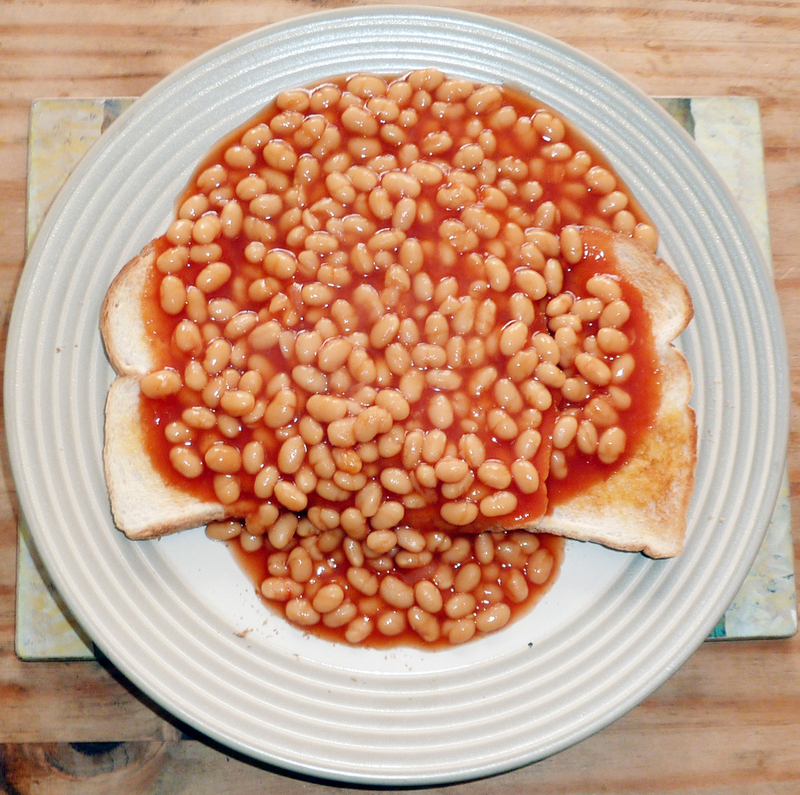 English Cooking: Baked Beans | Notes from the U.K. The English aren’t known for their cooking. Or they are, but not in a complimentary way. And I’ll admit they have some odd habits, one of which is eating baked beans on toast. But who am I to criticize? I grew up begging my mother to buy a kind of white bread that I could, and did, squish down to the size of a packing peanut. Which hadn’t been invented yet, but I was ahead of my time. And yes, I did eat it. She’d never have bought it again if all I did was squish it. And I’d have sworn it was good, so I know first-hand that there’s no accounting for taste. Still, it throws me to see an adult sit down to a plate of baked beans on toast and, with every sign of pleasure, eat it. But that’s not all that happens with baked beans around here. You can buy a baked potato topped with baked beans. (Or with cheese, or cole slaw, or curry, or roast vegetables, or shrimp, which are mostly called prawns unless they’re small, even for shrimp. And the potatoes are called jacket potatoes.) A full English breakfast includes baked beans, not to mention a grilled tomato. A single can of baked beans includes enough salt and sugar to cover Wales to a depth of half an inch. In spite of which, people eat baked beans in industrial quantities and live to ask for more, and why not? They’re full of fiber, which for all I know mops up the salt. Half the canned vegetable aisle is taken up with baked beans. I’m sure there are all sorts of subtle differences among the brands, but I’ll only do just so much in the name of research, and tasting them lies on the far side of an extremely thick dividing line. This entry was posted in Food and tagged Americans in Britain, anglophile, Britain, British food, England, English food by Ellen Hawley. Bookmark the permalink. I hope to get to eat baked beans on toast with you and Wild Thang some time in the future. I will bring grits, cheese, and garlic just in case you’d rather munch on that southern delicacy. Hurry. We’re setting the table. The thing is, you have to put cheese on top and then melt it under a grill. Or at least in a microwave. And then it’s yummy. And who are you to criticize? I bet you eat corn dogs when you can! Btw, are you aware that when this appears in the Reader, it’s titled “One Great British Cake: Lemon Drizzle”? Odd. Reading the actual post was actually like bringing a cup of tea to the lips and finding that it is, in fact, coffee. I know. It’s not exactly lemon drizzle cake, but that is what Dan Lepard, whose recipe I based it on, called his. And who am I, I asked myself when I argued the question through, to argue with a master baker? I couldn’t find a traditional lemon drizzle cake that didn’t use self-rising flour. I’m sure there’s one out there somewhere, but I couldn’t find it. Here you go, folks, a traditional lemon drizzle cake recipe. And if you’re not American, I’ll translate: A stick of butter is a quarter of a pound. If it comes to that, who are any of us to criticize? But as far as corn dogs go, I plead not guilty. I’m a vegetarian, so I’m vulnerable on the tofu front, but not the corn dog one. I’m pretty sure there’s no meat in a corn dog. I don’t think there is anything in a corn dog that could rightly be described as food, regardless of your dietary preferences. But this is all surmise … I simply cannot bring myself to wrap my lips around one of those things. I’m not going to suggest eating one, but I can swear that corn dogs are hot dogs dipped in batter and deep fried. On a stick. Bleah. Yes. I continue to doubt that the hotdogs used contain actual meat. Or any recognized food product. Bleah indeed. Anybody out there care to defend the honor of the hot dog? ?